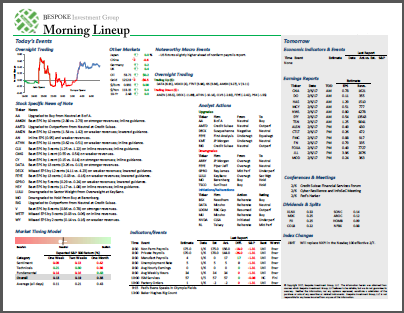 It’s a pretty quiet start to the trading week with just modest moves overnight and this morning in foreign markets, and little in the way of movement in treasuries. Dow futures are being weighed down by Boeing (BA), which cut production guidance on Friday after the close and received a downgrade over at Merrill Lynch this morning. General Electric (GE) is also trading down 5% after JP Morgan downgraded the stock to underweight. In this weekend’s Bespoke Report, we provided a detailed chart check-up and included snapshots of the setups for each of the S&P 500’s industries. To summarize how things looked on a group by group basis, the chart below summarizes the relative strength of each S&P industry’s performance versus the S&P 500 over the last year. Groups with green performance bars have significantly outperformed the S&P 500 over the last year, groups in blue are either modestly outperforming or underperforming the S&P 500, while groups in red have significantly underperformed in the last year. 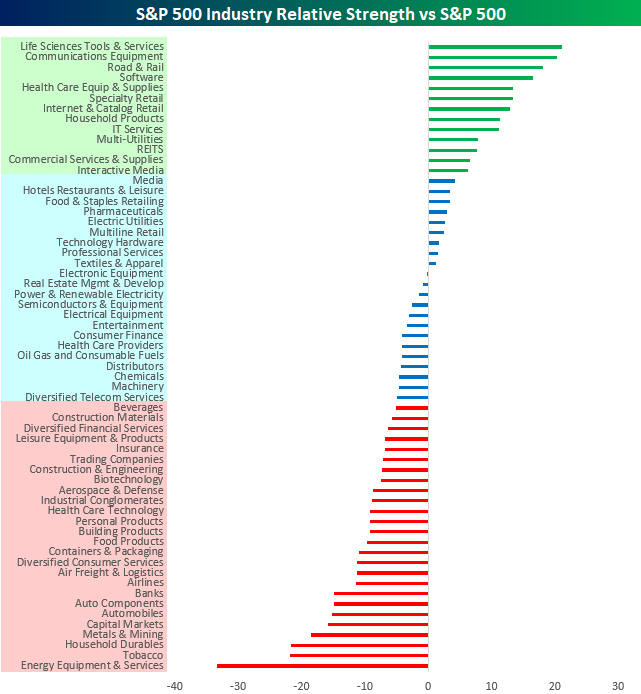 Leading the way higher, Life Sciences, Communications Equipment, and Road & Rail have been the top three performing groups, while Energy Equipment, Tobacco, and Household Durables have been the biggest laggards.